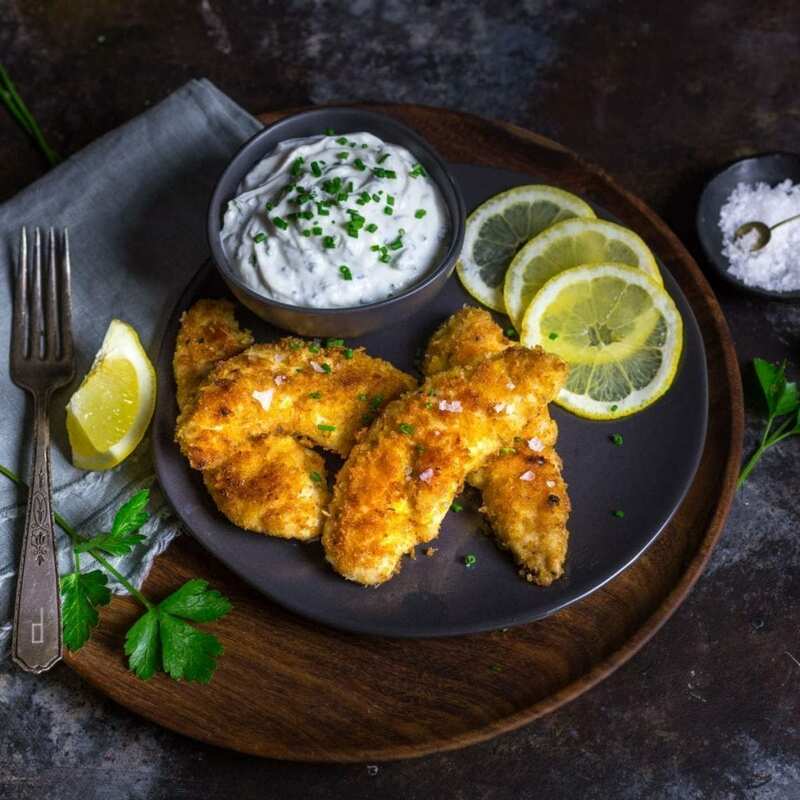 Crispy, crunchy oven-fried chicken tenders might look like kid food, but these are packed with enough flavor to keep the grown ups just as happy. We serve them with a garlicky, lemony, herb-packed yogurt dip. If someone took a quick glance at our blog, they might get the impression that we’re fancy people. We are not. Prime example: Matt’s desert island dish is probably butterscotch pudding (the kind made from a packet, mind you). And mine is probably tater tots. Yes, frozen potato nuggets, baked on a tray. See? Not fancy. Yes, we like to cook up some nice grub but it’s mostly simple stuff, just made (hopefully) with good ingredients and a little technique. 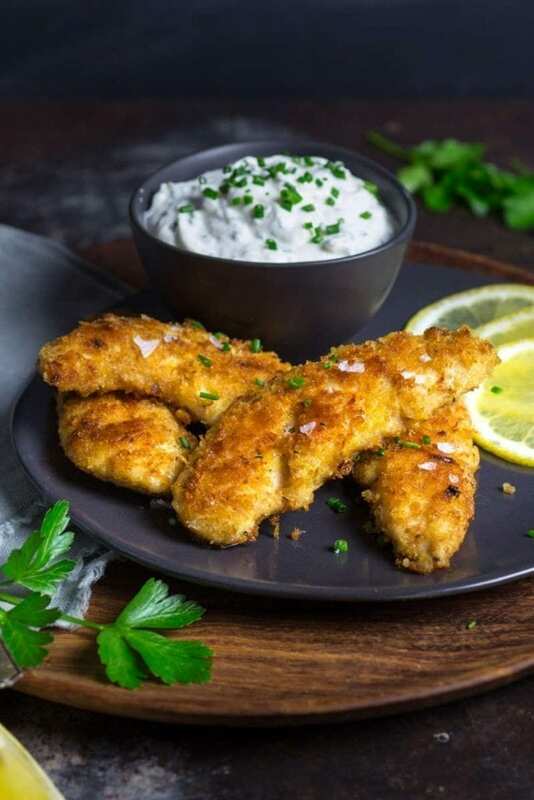 Same goes for this recipe, our crispy, crunchy baked oven-fried chicken tenders. Easy, healthy and quick. Best of all, our Oven-fried chicken tenders are seriously tasty. I don’t know about you, but real, deep-fried chicken is one of my all time favorite things to eat ever but, let’s be real, making it is messy, time consuming and it’s not exactly the healthiest option ever. That’s why we save the frying for special occasions and bake our crispy chicken most of the time. Now, often things that are ‘oven-fried’ come out pale, soggy and disappointing but it doesn’t have to be that way. Real crispiness is possible, as long as you use a few tricks! The first trick is to use panko breadcrumbs. Panko has a light, craggy texture that helps it get super crisp as it cooks. It also absorbs less oil than standard breadcrumbs, which makes food more crisp and crunchy. We use it for just about everything we need breadcrumbs for, but they’re especially helpful for oven-frying. The second trick is to brown the breadcrumbs before you dredge the chicken. 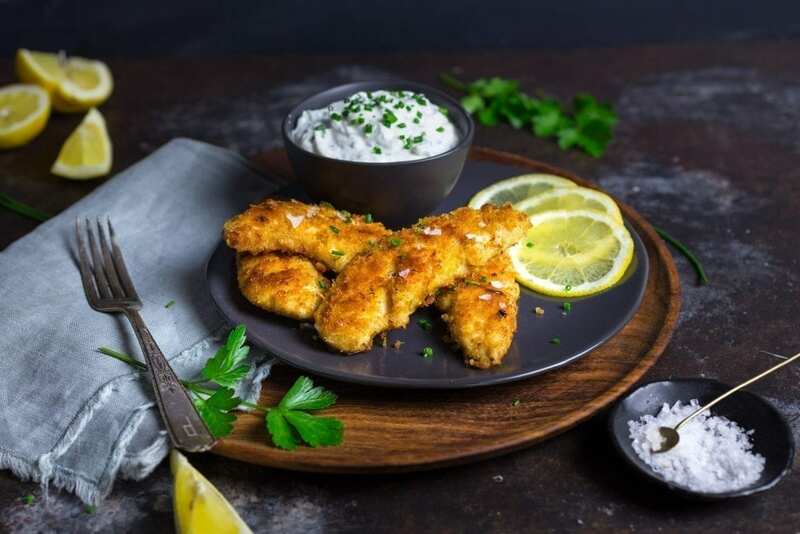 The reason why oven-fried chicken often comes out pale and unappetizing is because there’s not enough oil to caramelize the sugars in the crumbs, so they don’t turn brown. We get around this by toasting the crumbs in a little butter on the stovetop first, so they’re brown and crisp before they ever go on the chicken. Note: You can also put the crumbs on a tray and bake them but I like using a skillet for this. The last thing is to bake the chicken at a pretty high temperature (425ºF/220ºC), but be careful not to overcook them! Tenders, like all white meat, cook quickly and will get tough and dry if you’re not careful. High heat gives you maximum crunch, but it means that they’re done in a flash. Besides being crispy, we also want them to taste really good so we add a lot of flavors to the mix. A good amount of garlic (of course), a bit of dijon mustard and fresh lemon zest make these anything but boring. The mayonnaise does two things, the oil in it helps the chicken brown, and the egg in it helps the crumbs stick, without having to do the standard flour, egg, breadcrumb dredge. This makes the process faster and easier, which, yeah. 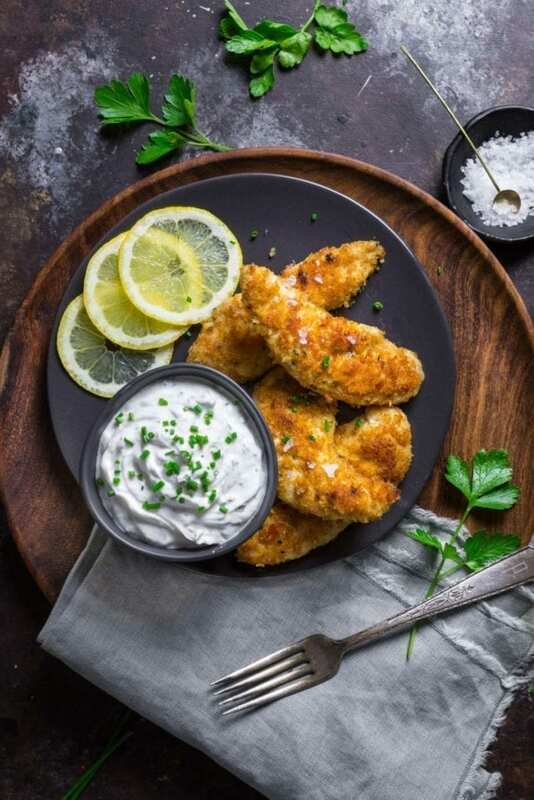 These are super tasty on their own but I’m always down for sauce so we made a simple, healthy dip with more garlic, lemon juice, Greek yogurt and lots of fresh herbs (basically a quick, healthy ranch dressing type thing). These would be great with anything you like with chicken though; barbecue sauce, honey-mustard, tonkatsu sauce. Make the dip:In a small bowl, add lemon juice and garlic. Let sit for 5 minutes (this mellows the raw garlic flavor). Mix in yogurt and herbs; season with salt and pepper, to taste. Set aside. Prepare the chicken: On medium-high heat, melt 2 tablespoons butter in an 8-inch skillet. When butter stops foaming, add panko bread crumbs and season with a good pinch salt and pepper. Cook, stirring often until crumbs are deep golden brown, 3 to 4 minutes. Add crumbs to a shallow baking dish and set aside. Dry the chicken well and season with salt and pepper. In a large bowl, mix together garlic, lemon zest, mayonnaise and mustard. Add chicken and mix well to coat each piece. Lightly spray an oven-safe wire rack with oil spray and place it over a rimmed baking sheet. Dip chicken pieces into bread crumb mixture, pressing to adhere as many bread crumbs as possible. Shake off any excess and place breaded chicken on the wire rack. Bake until cooked through and golden brown, 12-15 minutes. Serve with herb yogurt dip. what happened to the “print Page” button for us Luddites? I made these last night! They were super flavourful and crispy and easy to put together. Thanks for the recipe! These were excellent! I used a different herb mix for the chicken, but it didn’t matter. Even the dipping sauce hit the mark. I will make again very soon without the guilt.